Most information out there on Disneyland secrets tells you about the hidden Mickey Mouses around the park, or about Walts apartment above the Fire Station, but we wanted to share some lesser known tips about visiting Disneyland. These may not be tightly held Disneyland Secrets, but they are not advertised well and can be great tips to make your trip to Disneyland more enjoyable. 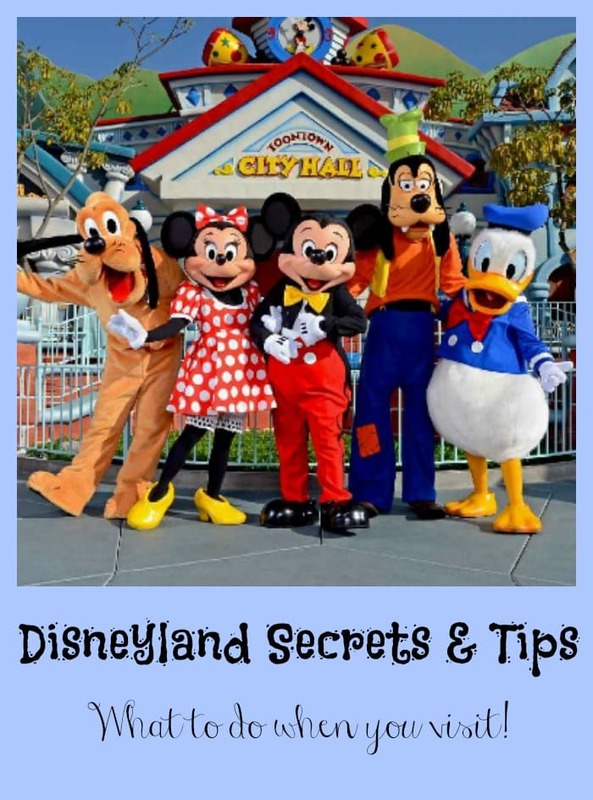 If you are a Disneyland regular, you may already be familiar with these “Disneyland Secrets”, but if not, here is a fun list to check over before heading off to Disneyland, to see if any of these things will make your trip better! Be sure to check out our Disneyland Deals page too, for more great ways to save on a Disneyland Vacation! We love the California Adventure Park, it’s a bit less hectic then the Disneyland Park as far as crowds go, in general. There is a special entrance to The Grand California Lodge Hotel into the Disneyland California Park. While this entrance is generally reserved for hotel guests during busy seasons (and you do have to show your key, but you can use it if you are staying in any of the three Disneyland Hotels), in my recent experience they told us you only had to be a hotel guest until 11am, and then they opended up the entrance to all (this was during the down season). This may change during more peak seasons, so you will want to check with the hotel during your visit, but if it’s open to everyone, it’s a great shortcut into the park if you are staying near the Grand California Hotel or visit their character breakfast, etc. Also, they generally allow anyone to come out of the park into the hotel via this entrance, so it’s a nice way to get to Downtown Disney from that park for a lunch or shopping break. One of our favorite early evening breaks is to head over to The Grand California Hotel and enjoy story time. In our experience, it has always taken place at 7:30pm, but you will want to double check with the concierge desk when you get there. Storytime happens at the indoor fireplace, so grab a favorite drink and relax by the fire while the kids listen to a fun and interactive story. My whole family goes each year and loves the break from the crowds! Here is an old picture from about 12 years ago, enjoying story time (they have kid size chairs). We went earlier this month (March 2014) and my younger kids still enjoyed great stories in the same kids chairs! My kiddo in that picture is 16 now – and he still comes with us to relax. 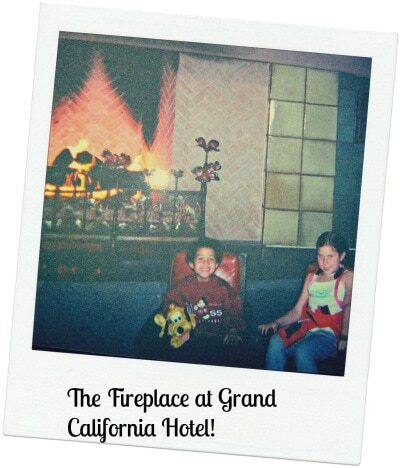 During our March 2014 trip, there was also a movie night by the outdoor fireplace at the Grand California Hotel. You will want to check with the concierge desk again to find the current schedule. They had cushions set out for the kids and played a new Disney movie every couple of days during our stay. Another way to end the night on a quieter note during a busy vacation. 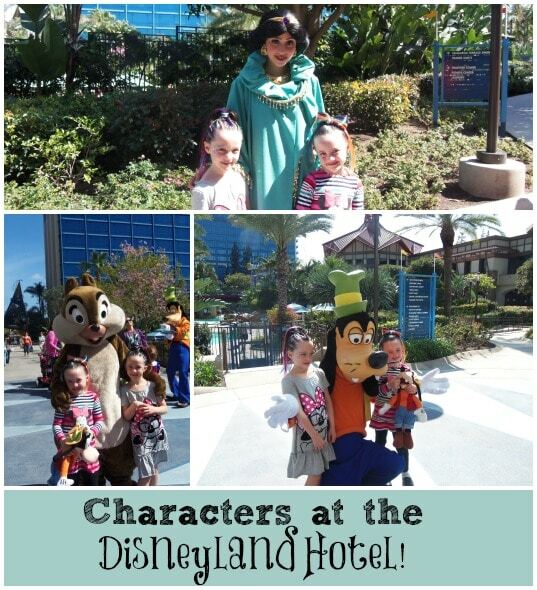 Tired of Character Lines at the Parks, Find Characters Roaming the Hotels! The lines at Disneyland for characters can get very long, and sometimes you wait in them and the characters have to leave before you get to the front, so this year we avoided those lines and visited with characters at The Disneyland hotel. We found Princess Jasmine, Pluto, Goofy, Minnie, and Chip and Dale roaming the grounds and no lines for pictures! We also learned a special solute at Storytime at the Grand California Hotel, and they told us that most of the characters (and certainly the Critter Characters like Chip and Dale) know this salute and will do it back. Its a fun way to let your kids feel like they have a special connection with the characters. You might want to ask at the concierge desk about the special character solute too! 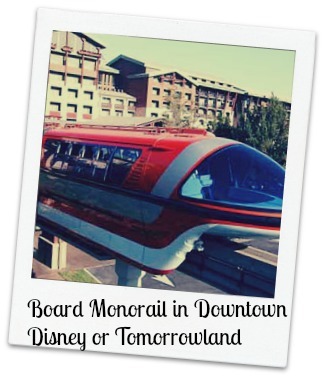 Ride in the Front Cab of the Monorail / Drive the Mark Twain Boat & More! This is easiest to do if you are visiting in off season (and if you use early entrance hours). Just request to ride in the front of the monorail (there is room for 4 ppl). If they have the ability to accommodate you, you will get those front row seats. If there is more than one party that has requested this, it can delay your wait time, but it looked fun! (Note – I heard they had discontinued this at Disney World, but they were doing it at Disneyland as of March 2014). One cast member told us that if we took the kids on the Mark Twain boat and asked for them to be able to visit the wheel house, they would take them up there and allow them to drive the boat (like many Disney rides, its an automated boat ride, but they feel like they are driving). They are even suppose to get a momento certificate. We ran out of time to try this, but the cast member assured us it was a special experience for the kids! I did read that not everyone is told yes, and that you need to ask nicely – so its not a sure thing, but it is possible! I have also heard that there is a special Tender seat you can ride on the train around Disneyland, but it was closed during our recent visit so I could not confirm this is still an option. Be sure to comment below if you can confirm it. You are suppose to just need to tell the conductor at Main Street Station that you want to ride in it (its a seat for two). Use Ridemax– this tool will cost you $15, but it can cut out hours of waiting if you use it to plan your ride schedule out. If having wait times is more important to you then leisurely working your way through the park then this is for you! There are also free Disneyland wait time apps you can use as well here and here. Visit the Disneyland Vacation Club for Fast Passes. During our stay, we were told that if we took a brief tour of the Disneyland Vacation Club (set behind the Disneyland Hotel) we would get Fast Passes! It actually looked really interesting, and low pressure, so we had wanted to check it out – but we ran out of time. Be sure to leave a comment if you have done the tour and let us know if it worked out for you! Tours opened at 8am while we were there. Ride the Monorail to avoid front gate wait times. This worked particularly well for us during the early entrance hour. It takes you directly to Tomorrow land, so only works if you are going into Disneyland and not California Adventure, plus my kids loved riding the Monorail too! You can catch the Monorail in Downtown Disney, so if you are looking for an affordable breakfast jump over to The Earl Of Sandwich before getting aboard ($3.99 for breakfast sandwiches – cheapest we found in the Disney area). Use the Single Rider lines, or Switch Passes to get through lines quicker. If your kids are older and you don’t mind splitting up for rides hit the Single Rider line. This worked really well on the Cars ride for us. We were on the ride in about 10 minutes. I went with my teen and he was in the car in front of me (so you have to ride with strangers) but it was a great way to get in a second trip on a long wait time ride after we had all ridden together as a family once. If you have kids of mixed ages like we do (5 to 16), you will love the Switch Pass. When one of our younger kids dont want to go on a ride (or is not tall enough etc), my husband will go with the other kids and ask for a Switch Pass when he gets in line, while I stay with the younger ones. Once they are done riding I can take the switch pass and one more person from my party and go through the fast line to get on the ride in a very short amount of time! We love this accommodation that Disney makes for families. Fastpasses help you get on rides faster. If you have been to Disneyland in the past then you are probably aware of how Fastpasses work. If its your first trip to Disneyland then you probably have questions on how it works. It is a pass you can get at all of the bigger rides that will allow you to get in a special line that is much shorter then the regular line. You simply put your park ticket in the Fast Pass machine at the ride of your choice and it will give you a pass that allows you to use the shorter fast pass line during a specific one hour period (that time will be noted on the Fast Pass machine). Read the fine print at the bottom of your pass, and it will tell you when you can get your next Fastpass (note – Fastpass tickets for Fantasmic and World of Color don’t count, so you can another one even if you grab those with no wait). 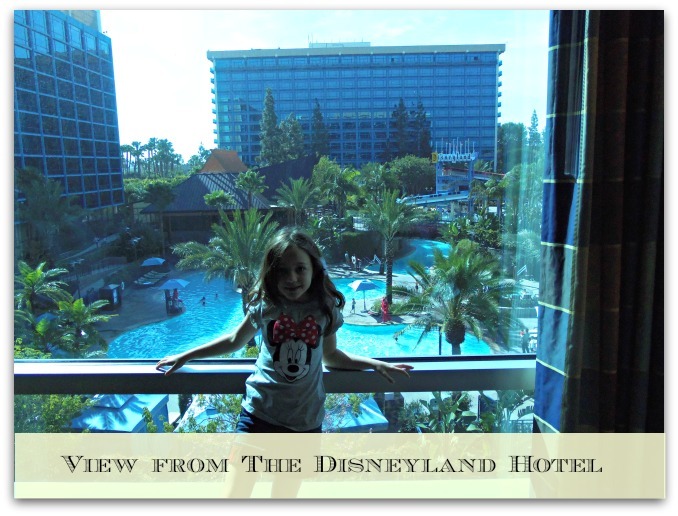 Hotels and Disneyland – How to save the most on your Disneyland Stay! Great tips! I wish there was a single rider option at Walt Disney World. We’ve never been to Disneyland, but hope to get there some day. Looks amazing! I like the tip about finding the characters in the hotel. We wasted so much time standing in character lines last time we went to Disney. Never heard of Ridemax. What a great tip! So glad to have found this post! Thanks for the tips, we are definitely going to try some of your tips to cut line wait times! Great tips overall for Disneyland! Also, I’ve heard that you can ride in the Lilly Belle train car that was designed by Walt Disney’s wife! I believe it only runs at a special time, and the advice is to ask the conductor first thing when you enter to park to see if you can reserve seats. We will be trying to do this on our first trip in the fall! Great tip Rebecca – let us know how that works out for you! Disneyland is on our bucket list. Big WDW fans, but haven’t made it to Cali yet! Lots of great info, thank you! Thanks for the Ridemax tip! I never knew that before. wow, thanks for the useful tips! Thank you for this information. I will be be using it when we go to Disneyland for the first time this summer. Great tips! We have been to Disney World many times but would love to visit Disneyland some day too! Love these tips! perfect for our next trip to Disney! I’d love to go to Disneyland. I have never been! Very helpful! Thanks for the tips! Never thought to find characters at the hotel! Great tip! Storytime seems like a great way for the kids to wind down, great tip! I love all these tips. It makes me wonder why I didn’t think to check before. Now I can’t wait to visit Disney. Lines are the worst!! Anything to shorten the time spent in line during the day is worth it. Thank you so much for the tips. Great tips for DL! We haven’t been with the kids yet but hopefully we’ll get there eventually. I love that families are able to ride in the front cab of the monorail – what a memorable experience that would be! We always visit Walt Disney World, so this is a great list to keep in mind for our trip to Disneyland! These are fantastic tips! We have been to Disney World many times but would love to plan a trip to Disneyland soon! Never go on the weekends!! Always go during the week, especially during school hours! Disneyland is on our bucket list! Thanks for the tips! We love the single rider line! And a lot of the time we are on the same ride anway! I would love to discover these secrets with my daughter! Wow! What great tips! Thanks!! This was a great article. I’ve never been to Disneyland. Only Disney World. I will keep these in mind if I get a chance to go. Thanks! Good tips! I hope we get to experience Disneyland some day! We’ve done the world and loved it! I’ve never been to Disney but if I ever get the chance to go I’m going to try to keep some of these tips in mind! Love the special entrance tip! Great tips! We used Ridemax in the past, and will again. The times it gave us were spot on and helped us make sure we got to all our “must do” rides. Will def get a park hopper when I visit Disneyland. I could probably do without at Disney World. The luxury of a private park entrance sounds amazing. These are awesome tips!! The Rider Switch is an amazing thing that Disney does so that if you aren’t going with other parents you can take turns with your spouse!! 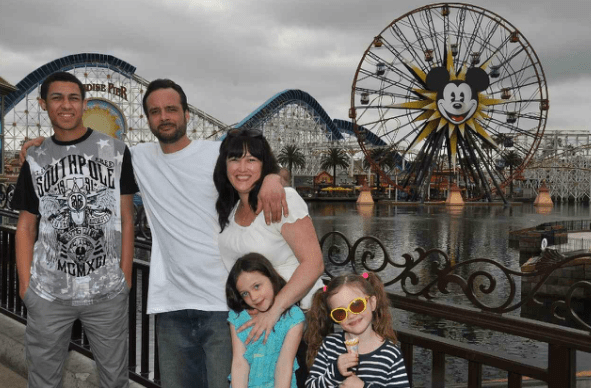 Disney really knows how to treat families which is why its the best vacation spot for them! Disneyland is truly magical! And we definitely recommend it to any family needing a break from the real world! Great Tips! I am so excited to take my kiddos one day. Exactly the info I was looking for! Thank you! Really awesome information! Thanks for tips. I hope we can visit Disneyland soon! This is awesome! I can’t wait until we (finally) go to Disneyland! We’ve never been before, but sounds like fun. Disneyland is the happiest place on earth!! That’s really neat that you can find characters at the hotels. Love Disneyland! It is our family happiest place for sure! The Switch Passes are great. We call them Parent Swap Passes because they allow parents to take turns going on a ride while the other one stays with the kiddo. Less time waiting = more bang for your buck! Love Disney, would LOVE to win a trip! great little tips and such!! Wow, staying in the park hotels really do come with some awesome perks!!! I’d love to run into the characters there! This is super cool and helpful! Great idea about using the single rider line, will have to try with the teens. I’m sure they won’t mind! Love the tip about finding characters at the hotels! Thanks! We love going to Disney World but haven’t made it over to Disneyland yet. Great tips for when we do! Get info! I love Disney???? Great tips! Hoping to take my daughter there soon! I had never heard of ridemax! we were around disney near the holidays and i just refused to go because of the thought of waiting in the lines. this sounds like a great way to avoid. My grandchildren would love storytime and movies at night at the Grand and I would love the special entrance. After Disney World we can’t wait to visit DisneyLand! I bookmarked this for later! Thank you! These are awesome tips. I will be looking for the characters at the hotel now! Thank you for the Disneyland secrets and tips. I like to no that the characters will be through the halls of the hotels. This way we dont have to spend half my day chasing them down for my 6year old daughter. I would love to do Disneyland one day! have only been to Disneyland once in 1994 so a lot has changed since then! That’s super cool! Thanks for the tips. Thanks for the great tips! Fast passes and switch passes will be must my next Disney trip! I need to make it to Disneyland someday! I love the app that gives wait times at the most popular rides at Disney. It helped us miss the big lines and made us have more time to enjoy the Disney Magic. Great tips! Thanks for great tips. we have never been to any Disney. I Would Love To Take my grand kids when money will allow. i have 4 grad sons but would love to take the 2 youngest a 5 & 2 year old. Thanks for the great tips! Going to try one of those breakfast sandwiches next time. We were there in January 2015 and we were able to ride up front in the Monorail. Haven’t used the monorail yet! Nice post. Thanks for the ridemax tip. I love the idea of movie night. Thanks for letting me know that it is offered by the outdoor fireplace at the Grand California Hotel. I love hearing new tips. We live 3 hours from Disneyland so we go a couple of times a year. I love walking the parks and seeing everything. I have my favorite things to do. No matter what your age is, it’s a wonderful place to visit. great tips. wish I would have found these before we went in November. I have heard about most of these tips…just need to actually try them! Thanks for the reminder! So many great tips! Thanks for your Disney insight! I can’t wait to bring my girls! Thank you for the tips on how to shorten the wait times. Take your time. We thought that we had to rush to see and do everything, then ended up missing so much!!! No more secrets it’s all in this article! Disney is a great family experience, just have to keep expectations realistic. You can not accomplish everything there is to do in one day. These tips are so helpful. Thanks for posting. My favorite secret is that the old-timey phones on Main Street work and are fun to listen to! Love that Lisa – that is a great one to add! I seriously hope we gt to go one day! I want to experience all the excitement and fun with my family! Characters at the DL Hotel? That’s AWESOME!!! Lot’s of great tips. Thanks for all of them. We have never been to Disney Land, only Disney World! Would be interesting to see the differences. great tips!! will def keep this in mind when i can finally afford to take my family to disney!! Characters at the Hotel?? This is amazing news! Thanks! Super tips – the hotel info was Very useful! Thanks for the tips for Disney Land! We hope to make it to the parks one day! Thanks for sharing your trip! How does Disneyland compare to WDW? If you had a choice, which one would you go to? Hi Dawn, There are a number of differences but one big one is the size of the two parks. Walt Disney World is huge, and laid out across many miles. To get from park to park you must use some kind of transportation (they have lots of it in place – busses, trams, ferries, etc). Disneyland has two parks (Disneyland and California Hotel) with Downtown Disney attached and the three Disneyland resorts all right there is walking distance. I have been to both and love them for different reasons. 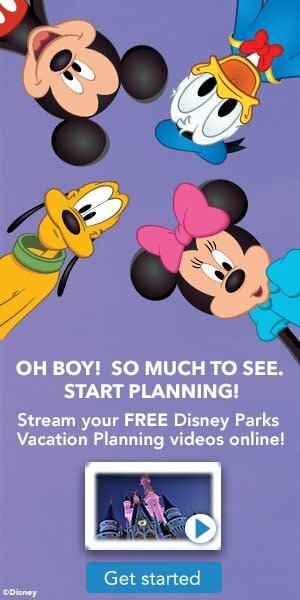 When choosing a park I consider things like proximity to the location (how long will it take me to travel there), age of my kids if I am traveling with them (I like Disneyland better when they are young as we just park and visit and nap during the day) and save Disney World for when they are older, time I have to visit parks (takes more days to get through all the parks of Walt Disney World, and specials available for the locations. Those are my personal preferences – but would love to hear from others and what park you prefer and why? Great information! I can’t wait to take my kids to Disney someday. ???? When I go to Disney Land or Disney World, I have to stay on property. Nothing beats a true Disney vacation experience than staying in the heart of the magic. It may cost a bit more, but the benefits truly out weigh the added costs. The single rider line for Cars is worth it! Very useful tips for a first timer. Thanks! We stayed there last year and the monorail was a life saver to get to the entrance or back to the hotel when our feet were killing us! I’ve only been to WDW but if the opportunity ever arose, I would keep some of these tips in mind. Don’t waste your money on a wait time app when there are so many superior ones that are free! Do you have a favorite you use David? Great tip about finding characters at the hotels. Sometimes the lines to meet and get their autographs at the parks is crazy! Thanks for all the tips! They will come in handy for us! I have been told to use ride max by friends who have been also. Fingers crossed that a miracle will happen and I can finally go one day. Thanks for the Tips. Great tips – I would love to be able to use these tips with my family one day! Great tips! I will have to try out the Switch Pass next time. Great article … I love Disney !! Thanks for the tips! My family loves DIsney!!! These are great tips, thanks so much! The characters at the hotel make it so worth it! The storytime is something we will be sure to do. Great tips! We’ve only been to WDW but Disneyland is on our must see list! Thanks for the great tips! I’m so ready to visit! Thank you for all the great tips. The one thats sticking out the most to me is visiting off season. That makes the most sense to me and I think will make the most impact on our trip. Such great information, thanks for sharing! I love hearing secrets. Shh. I love the idea of enjoying the hotel amenities as well as the park! Thanks for all the information! These tips are great. Its often harder to find tips for Disneyland than for Disney World. So many great ideas. I love the idea of starting out on the monorail to get into tomorrow land and work your way towards the front.